Surgical instrument detergent enzyme lubricants cleaners clean and condition. The ONEcleaner surgical instrument cleaning detergent lubricating enzymes break down all forms of surgical contamination. Detergents clean the surface of surgical instruments, while the four enzymes breakdown all forms of surgical soil, and lubricating conditioners enhance the protective passive layer of surgical instruments. The ONEcleaner enzyme detergent lubricating surfactants avoid corrosive pitting of surgical instruments and soften hard water for spotless cleaning. 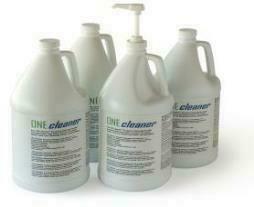 The ONEcleaner surgical instrument detergent enzyme cleaners are the most cost effective enzyme detergent cleaners. The enzymatic surgical instrument detergents that clean more effectively and lubricate while they clean. 0225-30 Surgical Instrument Enzyme Detergent Cleaners, 30 gallon jug.